You can travel to DC, Baltimore, or the nearby areas in luxury and comfort. Drop your things off at our lovely home in Columbia, MD. We'll do the rest! Stocked breakfast/snacks, coffee, and amenities are the standard here, along with office, desk, and wifi. 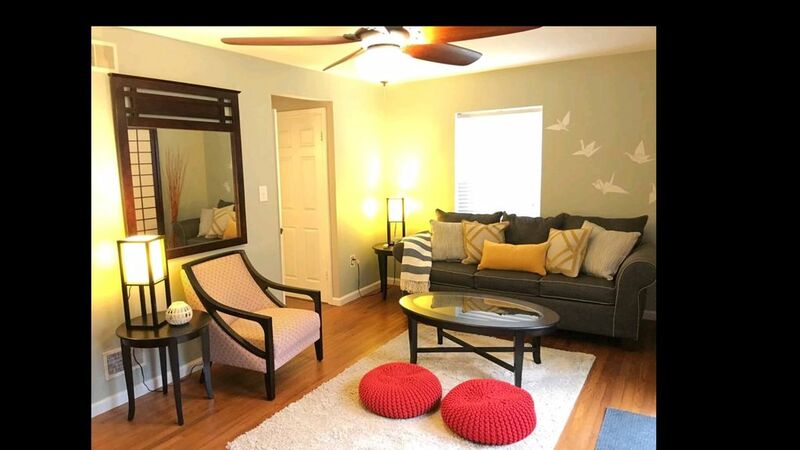 The space listed is for an entire end-unit townhouse (3 floors with deck/garden and free reserved parking spot) in a quiet community setting in Columbia, Maryland. Here, you will be within an easy commute to the Town Center, Merriweather Post, and the Lakefront. The house is an easy commute (20-30 minutes) from Baltimore and Washington DC. You can even travel to New York City on a 2 hour Acela train. Our home is set up to cater towards the traveling professional or to be a home away from home. It has a whole office room and more workspace/desk in a bigger bedroom. We have extremely fast FiOS quantum gigabit wireless internet access. Breakfast (non-perishable foods like organic granola, cereals) and stocked coffee or tea (automatic, timer-ready coffee pot, coffee, filters, selection of fine teas, tea pot) are always available. There is a reserved parking space on the premise that is located right outside of the townhouse, which you can use during your stay (no need for hangtag or permit display, you are welcome to use the reserved spot in front of the house at the end of the parking row next to the oak tree). There are plenty of other free parking spots scattered throughout the lots. Columbia is extremely safe and walkable/bikeable with walking paths connecting to all areas. A car is recommended to travel quickly from place to place. A variety of shopping is located within a few minutes of the townhouse. There is also access to a deck, organic fresh garden (flowers, and vegetables/spices on some years), and outdoor gas grill on the premises. Additional features include the nearby Haven on the Lake, where you can purchase spa services or a day pass to the healing environment for a small fee. The house is newly furnished with new furniture. The first floor includes the foyer/dining room, full kitchen (all cooking and dining materials with pots/pans, blender, slow cooker, utensils, spices, condiments, cooking sauces, etc. ), full refrigerator, half refrigerator downstairs, full freezer downstairs, microwave, stove/oven, top-of-the-line Samsung dishwasher, sitting area, and half bath. You'll find a plush couch with large down throw pillows and a comfortable sitting area with an electric fireplace. The couch can sleep one extra guest. An extra air mattress can be set up in the living room to sleep 2 additional guests (stored under the master bed upstairs). The fireplace has various settings for all-season use, so you can still enjoy a cozy flame without the heat for the summer. The upstairs area includes one master bedroom with a large closet and a smaller, additional bedroom. The master bedroom has a white electric fireplace with various heat settings and all-season adjustments similar to the first floor. The master bedroom sleeps 2 guests and has comfortable high thread count sheets, down comforter (down alternative available too), bright decorations, and TV (Chromecast installed/compatible with Netflix etc, cable, HBO). There is an office room with dresser, laser printer, 1 office chair, and desk. There is a Lubi sleeper daybed by CB2 that converts to a king size bed which can sleep two guests comfortably. The second bedroom upstairs is equipt with a queen size platform bed with memory foam mattress that sleeps two guests comfortably and its own closet. There is also a linen closet and a full bath with nourishing shampoos/conditioner (Dove) and Kirkland body wash as well as marble bath accessories and plush Turkish cotton towels. We also provide guests with fresh, white bathrobe for extra comfort. The shower comes with a large rainfall showerhead that has over 10 various massage settings and a combination of settings to make sure that you have the ultimate comfort and relaxation. The downstairs area includes one very large, full bedroom that sleeps two guests with three large closets and a full bath. The downstairs bedroom has a queen bed with king-sized down comforter (down alternative available), luxury bedding, and bright decorations. It has a small office workspace with desk and bookcase set up. The bath amenities have nourishing shampoo/conditioner (Dove) and Kirkland body wash as well as plush Turkish cotton towels, white bathrobe, and extra towel sets. The downstairs bedroom has a private door with an optional lock on it for extra privacy. The area outside of the bedroom has a utility room with top-of-the-line washer/dryer that is extremely quiet. The Samsung washer has settings for every type of wash including steam/dry cleaning, and the dryer setting has steam/dry cleaning features as well. There is a full freezer, extra mini refrigerator (for easy access to late night snacks/drinks), and a wine rack/pantry which we stock intermittently with extra treats. I am often in town and available if needed by telephone, text, email or Airbnb message. I can have someone drop by if you are renting for a long period to restock supplies or to help with anything. I am a lifelong resident of Maryland and very familiar with the area as well as DC, Baltimore, and NYC if any guests need recommendations for restaurants, tourism, or transportation. The rental is for an ENTIRE home, so you will have total privacy during your stay. scenic lakes and outdoor activities. We had a great time at Michael's townhouse! It was everything we wanted for my low-key 30th birthday weekend. With ten adults, we had room to cook, eat, play games, and sleep comfortably—we had one person on the living room couch, a couple on the provided queen-size air mattress on the floor of the living room, one person in the room with a twin-size daybed that easily converts into a king, two people in the master bedroom, two in the second bedroom upstairs, and two in the basement bedroom. All reported a good night's sleep. Everything was clean and the townhouse had what we needed. Michael also left very clear instructions and we had an easy time checking in and out. We also went over to Haven on the Lake after as per Michael's suggestion and it was lovely! We tried their pool, hot tub, steam room, cold plunge, and salt room, but next time we'd check out some of their classes too. This rental was just what we were looking for and Michael's hands-off-but-just-a-message-away approach gave us privacy and reassurance. If the occasion were to arise, we would book this property again without hesitation. The property was spacious with plenty of room to relax and a well equipped kitchen to fix meals. We did not use the deck or grill but they looked nice. Michael provided detailed instructions about everything in the unit - a great plus I wish every homeaway owner would do. It is super close to lots of restaurants, shopping and the interstates. The neighborhood was quiet. The home was perfect for our family. Everything was clean and in good condition. Check in and out was easy and flawless. Would definitely stay there again. Thanks Michael! This townhouse was clean and spacious. We had more than enough room and plenty of amenities. We were house-hunting, so having a change to live in the community for a few days was very helpful. Convenient location, comfortable home, and great access to walking and running paths. Michael provided great communication leading up to our stay and a comfortable, clean and conveniently located home. Great location near grocery, restaurants and the mall. The kitchen was very well equipped as was the rest of the house. Michael was very welcoming and offered to do anything we might need to make our stay nicer. But he already had everything we needed there. The space listed is for an entire end-unit townhouse (3 floors with deck/garden and free reserved parking spot) in a quiet community setting in Columbia, Maryland. Here, you will be within an easy commute to the Town Center, Merriweather Post, and the Lakefront. The house is an easy commute (20-30 minutes) from Baltimore and Washington DC. You can even travel to New York City on a 2 hour Acela train. The townhome is set up to cater towards the traveling professional or to be a home away from home. It has a whole office room and more workspace/desk in a bigger bedroom. You will experience extremely fast FiOS quantum wireless internet access. Breakfast (non-perishable foods like organic granola, cereals) and stocked coffee or tea (automatic, timer-ready coffee pot, coffee, filters, selection of fine teas, tea pot) are always available. There is a reserved parking space on the premise that is located right outside of the townhouse. There are plenty of other free parking spots scattered throughout the lots. Columbia is extremely safe and walkable/bikeable with walking paths connecting to all areas. A car is recommended to travel quickly from place to place. A variety of shopping is located within a few minutes of the townhouse. There is also access to a deck, organic fresh garden (flowers, vegetables, and spices), and outdoor gas grill on the premises. Additional features for a spa pass to Haven on the Lake can be included for a small fee. No smoking, no drugs, no loud noises after 11pm. Our community is quiet and family friendly. We allow small pets for no additional fee so long as you clean up after your pets. If your pet damages the furniture or you are unable to clean up after your pet, then we will retain your security deposit as an additional cleaning fee. Always turn off the gas for the grill after use. We are happy to have had guests stay with us for important life events, however the home is not suitable for party rentals.